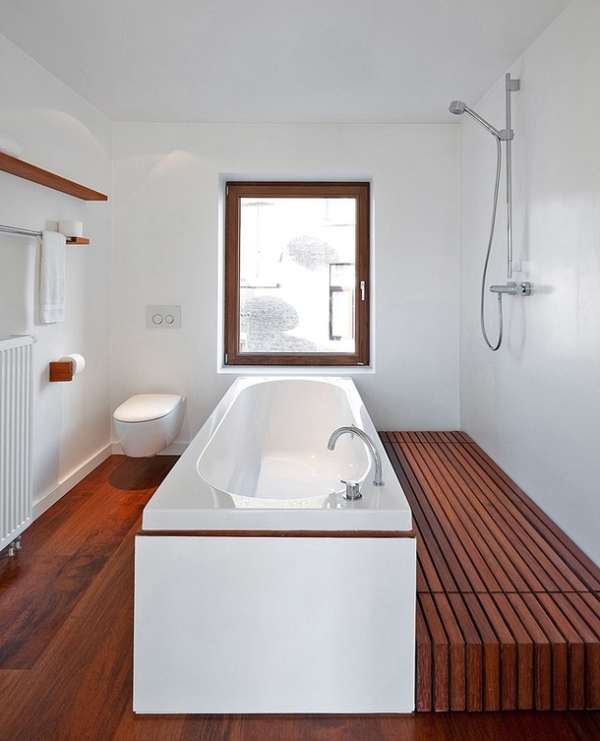 There are two types of a bathtub location: middle of the room or against a wall. This is the first question that you will have to answer before a work of plumbers. After that you can go to the creative procedures and think about the style of design in the interior. Central location gives maximum attention to the bathtub. 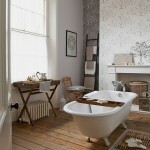 Therefore, many usually use such models as clawfoot baths, antiques and other samples of sanitary art. 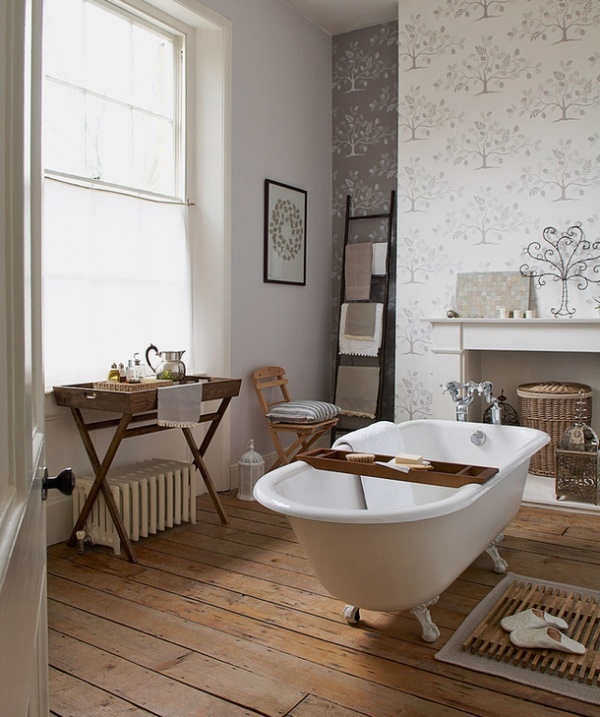 Standalone bathtubs require space, but in combination with windows and fireplaces help to create a residential atmosphere in the bathroom. A simple way to refresh a classic interior is applying modern wallpaper on the wall. Here there is a metal tree on the mantelpiece, which matches the wallpaper and the drawing on the wall. It enhances the decorative effect. 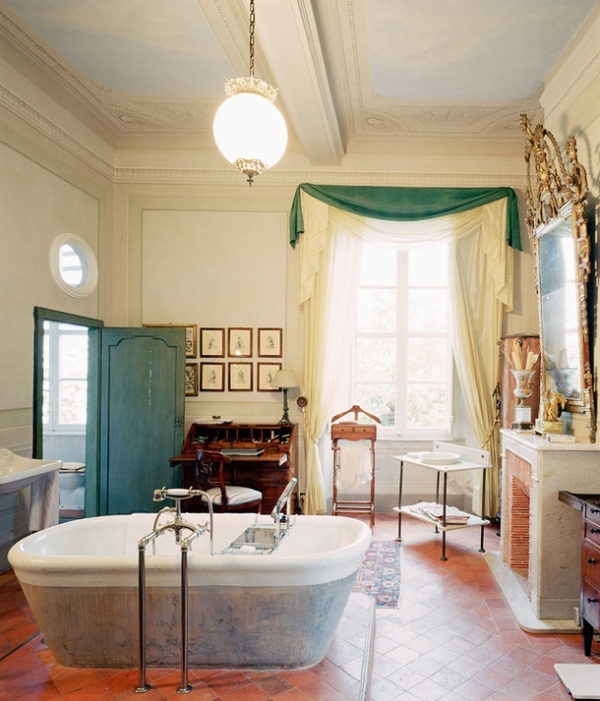 This kind of plumbing would fit perfectly a bathroom in a lush classical style, but in the end the interior turned out to be quite eclectic. 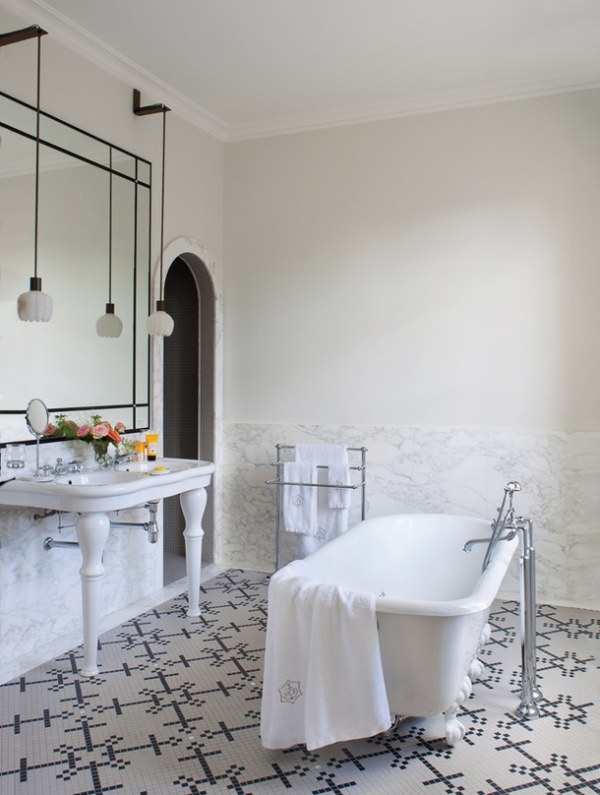 Black and white tiles on the floor and graphical composition of mirrors and lamps made ​​the room look quite modern. 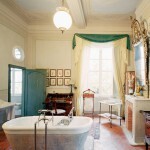 Office bathroom emerged during the restoration of the XVI century villa. However, this is not the restoration of the former luxury, but a romantic fantasy on the theme of the past. Antiques and antique tiles on the floor provide a feeling of authenticity. 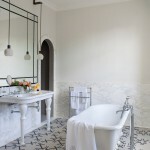 The designers also have not forgotten about practicality: in order to simplify the plumbing job, and visually isolate the bathing place at the same time, the marble bath was placed on the podium. This is a former dairy farm turned into a residential house. The bathroom occupies one of the oldest pantries. Bricklaying and stone slabs on the floor were preserved from those times. 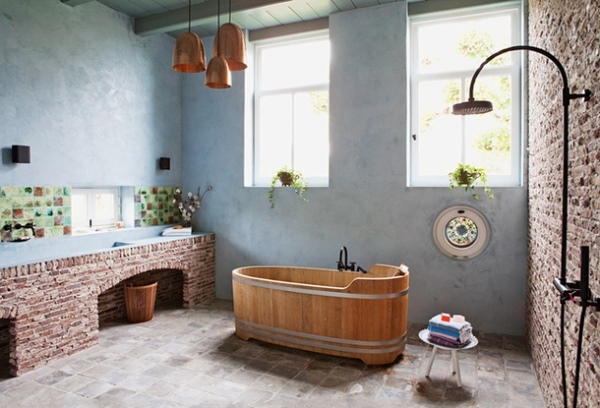 The interior is sustainable: the bath is made of wood, and handmade tiles and polished plaster were used as the finishing materials. 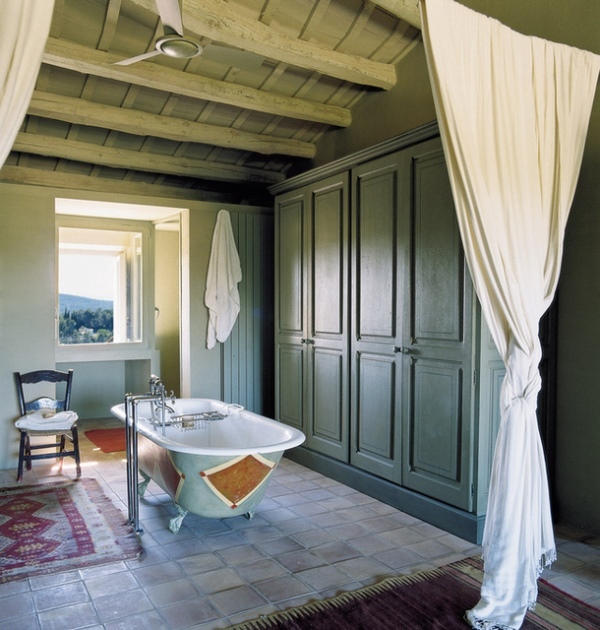 The decor in this bathroom creates calm atmosphere due to the color, which resonates with the landscape outside the window. 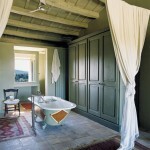 The walls, antique beamed ceiling and large closet are painted in gray- green color. Such uniformity helped the unwieldy giant dissolve in the interior. The window’s location provided a symmetrical layout of the bathroom. The sleek design emphasizes purity of the layout decision. 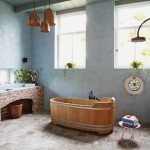 The podium of merbau wood is installed instead of a tray in the shower area. It is a solid water-resistant rock.